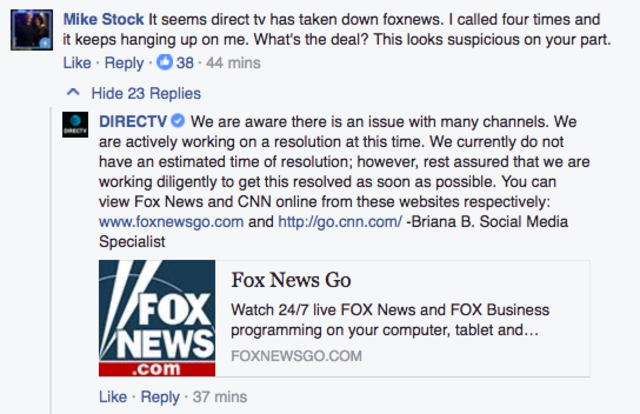 Some DirecTV consumers are reporting that they are not seeing Fox News and CNN channels . The company responded to consumers complaining on its Facebook page, saying it is "aware there is an issue with many channels." According to the Washington Times , the channel that usually broadcasts Fox News had a message from DirecTV: “We are experiencing temporary technical difficulties. Please stand by. We apologize for the inconvenience.” The message was posted in English and Spanish. The CNN channel was unavailable but showed a message indicating it was a pay channel. The outages have occurred for two days, the Washington Times said. A DirecTV customer specialist said the company is "actively working on a resolution at this time. We currently do not have an estimated time of resolution; however, rest assured that we are working diligently to get this resolved as soon as possible. You can view Fox News and CNN online from these websites respectively: www.foxnewsgo.com and http://go.cnn.com." AT&T said in a statement regarding the outage that eight high-definition channels for satellite customers were impacted by technical difficulties , including CNN HD and Fox News HD.